Is SADC’s work in the DRC over? President Joseph Kabila of the Democratic Republic of the Congo (DRC) told heads of state at the recent 38th Southern African Development Community (SADC) summit in Windhoek that he wondered about the purpose of a farewell speech. ‘Is it because I will miss you or is it because you will miss me?’ he asked, provoking much laughter. Kabila’s second mandate expired at the end of 2016. He has agreed to hand over power at the end of this year. Kabila went on to thank SADC leaders for helping his country over the past 20 ‘long and difficult’ years, notably during the 2006 and 2011 elections. Congolese people would forever be grateful for all the sacrifices ‘including the blood of the sons and daughters of the SADC countries that was spilt on Congolese soil’, he said. Several thousand soldiers from the region were deployed in the DRC following the ousting of former dictator Mobutu Sese Seko in the late 1990s. The SADC intervention by Namibian, Angolan and Zimbabwean troops in 1998 was to protect the regime in Kinshasa against Rwandan and Ugandan rebels. More recently South Africa, Tanzania and Malawi deployed soldiers as part of the United Nations Force Intervention Brigade in the eastern DRC. SADC’s role in the current trajectory to cajole Kabila to step down is however still a matter of debate. According to the SADC Organ on Politics, Defence and Security Cooperation, the organisation has played a major role in ensuring that the December 2016 agreement leading up to elections in the DRC has been respected and that elections are now on the cards for 23 December 2018. Most elements of this agreement, such as the ending of political repression, do however remain outstanding. Congolese officials insist that Kabila’s stepping down was an internal matter. In fact, the country doesn’t want any external interference in its affairs. 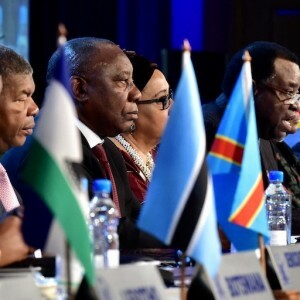 Asked about a possible appointment of former South African president Thabo Mbeki as special envoy to the DRC, a high-ranking DRC official at the summit told ISS Today that the country was refusing any further international mediation and ‘doesn’t need any babysitting’. Kabila also said the electoral process wasn’t the result of ‘any kind of blackmail’. Whatever the case may be, most SADC leaders, having congratulated Kabila with a sigh of relief, seem to believe the organisation’s task in the DRC is now over. In its final statement of the summit, SADC simply congratulated Kabila and said ‘the government of the DRC will continue to provide the necessary funding and logistical requirements to enable the conduct of peaceful and credible elections’. When asked about this, Namibia’s President Hage Geingob, the new SADC chair, said despite fears that he would not step down, Kabila had appointed a candidate of his party and even gave a farewell speech. ‘To us this is good news, what more do you want?’ he said. Geingob said SADC couldn’t interfere in a sovereign country such as the DRC and that it was up to the citizens of that country to ‘work for democracy’. According to DRC experts, logistical support will have to come from somewhere if the elections in this vast country of 46 million voters and very little infrastructure are to be free, fair and democratic. But the DRC has turned down external help. Does this mean the end of the road for SADC in the DRC? And could the DRC’s insistence on self-funding the elections be a stumbling block that could delay the process? Geingob has been outspoken in favour of democracy, inclusivity and good governance in the region. He also has good credentials on this score in his own country. However, his stance on the DRC might not bode well for the future. Asked about the troubles in SADC’s newest member the Comoros, where a controversial constitutional referendum took place on 30 July, Geingob reiterated his stance on state sovereignty. He said SADC was there only to help the country be more inclusive, but it couldn’t dictate to it. Going forward, Geingob and SADC will have to show that it is committed to upholding democracy in the region, given its rather dismal track record. At the 38th summit, for example, little was said about the Zimbabwe situation, except to congratulate the country for ‘peaceful’ elections. In Madagascar, SADC has been fairly successful in mediating behind the scenes, but will have to stay involved to make sure elections in that country in November are inclusive and democratic. The only firm stance by SADC on a crisis in the region was regarding the situation in Lesotho. In uncharacteristically harsh terms the organisation said it ‘will not entertain any further delays’ in the implementation of the reforms and national dialogue drawn up by SADC several years ago. Ensuring stability in Lesotho and the island states in SADC is important, but ensuring the DRC is placed firmly on the road to fair and democratic elections is even more so. SADC has various tools and instruments to make sure this happens. This includes the SADC principles and guidelines governing democratic elections. It also has a mediation unit at its secretariat. Kabila’s entertaining speech in Windhoek shouldn’t deter the organisation from using these to continue being involved in the DRC.